As the shadow of Mordor extends its reach, ever more people are torn from their homes and left without safety or refuge. When you are met with one such band of wanderers, you find yourself honor-bound to deliver them to a new setting where they may finally find peace. But the road is treacherous and fraught with dangers. Will you be able to keep them safe? Who knows what you may encounter over the Edge of the Wild? 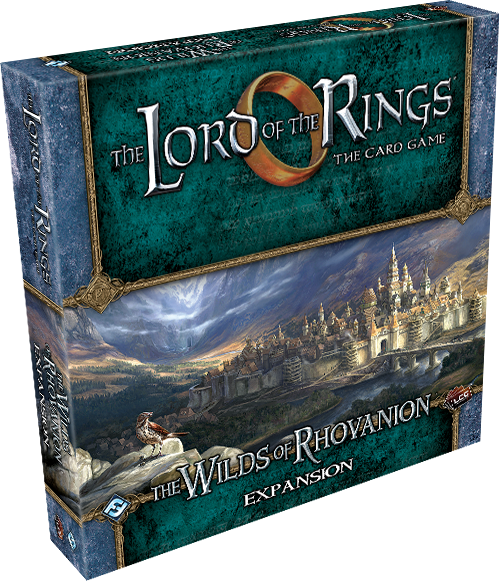 Fantasy Flight Games is proud to announce the upcoming release of The Wilds of Rhovanion, a new deluxe expansion for The Lord of the Rings: The Card Game, available for preorder at your local retailer or on our website here! 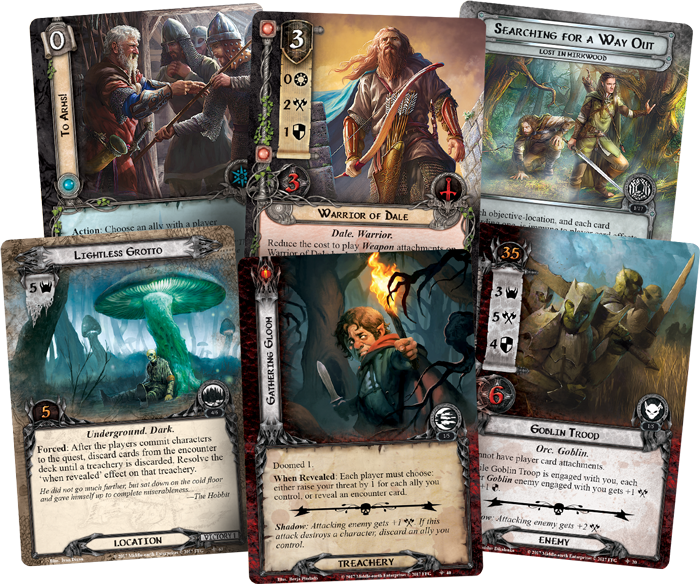 The Lord of the Rings: The Card Game is a cooperative Living Card Game® that transports players into the world originally penned by J.R.R Tolkien, where they will embody some of the realm’s most powerful heroes and explore Middle-earth like never before. 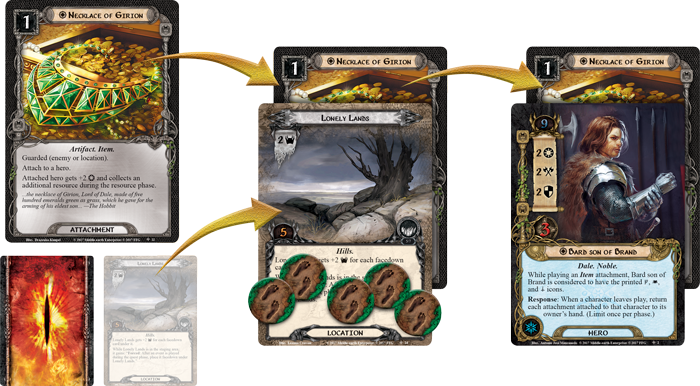 With various difficulty levels to embrace both new and experienced players, The Lord of the Rings: The Card Game allows you to embark on an engaging adventure that is truly your own. In The Wilds of Rhovanion deluxe expansion, you take the first steps in another new adventure, stretching forwards through a cycle of upcoming Adventure Packs. On this adventure, you accompany a group of refugees seeking asylum in the Wilderlands. This expansion explores the vast untamed country of Rhovanion in three original scenarios that take you from the Vales of Anduin, through Mirkwood Forest, and into the Iron Hills. 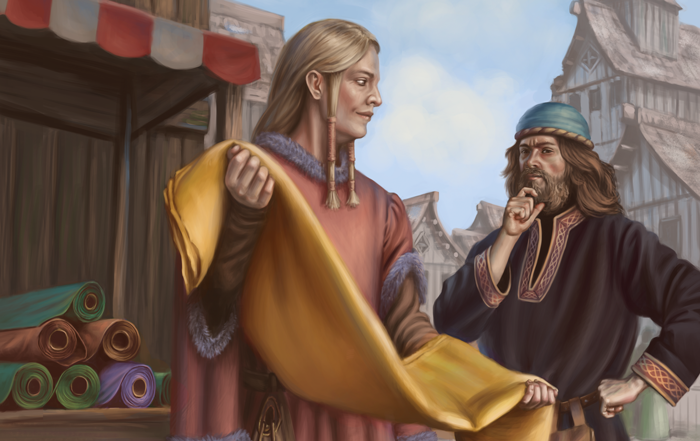 With an expansive 156 cards—including two hero cards, thirteen quest cards, 39 player cards, and 102 encounter cards—The Wilds of Rhovanion introduces new ways to expand your quests and help you master the art of trade, as perfected by the merchants of Dale. Your adventures begin in "Journey up the Anduin." Here, your small band of adventurers make their way up the mighty Anduin river, bringing with them the remnants of Haradim tribe whose village was destroyed when they defied Mordor, as chronicled in the Haradrim cycle. While both the Steward of Gondor and the King of Rohan have denied them refuge, they were granted safe passage north. Now, they make their way towards Dale, but the journey is long and winter is nigh. To make matters worse, Warg-riders and Mountain Trolls have been spotted along the journey. This land is no longer safe. 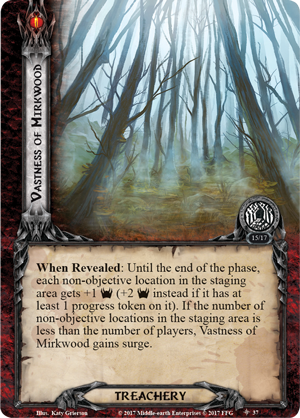 As you progress forward, "Lost in Mirkwood" draws you deep into the cursed forest, where only the brave, the desperate, and the foolhardy will tread. The Forest Road is the heroes’ only path through Mirkwood, but it is a perilous crossing. 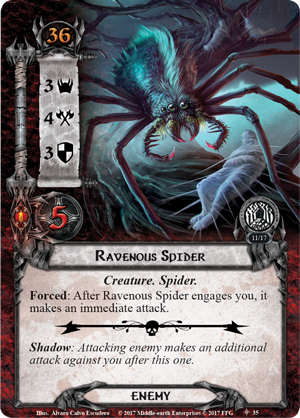 To the south, the fortress of Dol Guldur has again become a place of evil and its influence can be felt throughout the darkening forest, while to the north, sinister spiders and their many traps await. When faced with the Vastness of Mirkwood (The Wilds of Rhovanion, 37), you may feel the icy breath of fear upon your neck as the threat of each non-objective location increases. 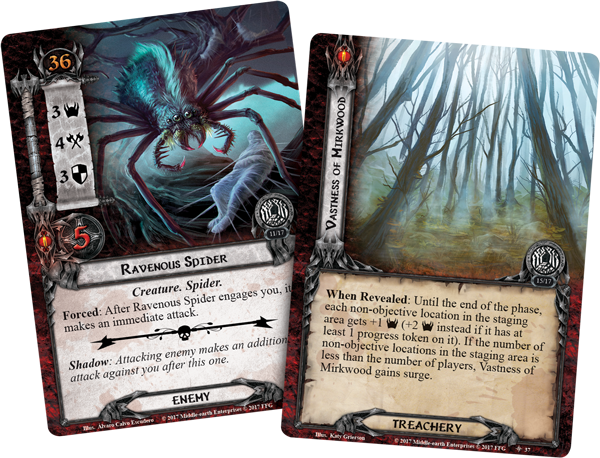 Once within the depths of the forest, you may be confronted by Ravenous Spiders (The Wilds of Rhovanion, 35) who strike without warning. To wander off the trail could mean to be lost forever. If you manage to escape the grasp of Mordor and reach your destination, new challenges await you in "The King’s Quest." King Brand is sympathetic to the plight of the Haradrim, but cautious for the safety of his own people. However, the king has a task that may offer you a chance to prove your loyalty. Villages are being ransacked on the borders of his realm and with his forces already stretched thin, it is up to you to explore the caverns of the Iron Hills and discover the cause of this destruction. In this quest, you will explore Middle-earth’s Deep underground. Locations with the Deep keyword draw you into the caves of the Iron Hills, forcing you into the darkness whether you are prepared for the dangers that await you there or not. Exploring these caverns and dealing with the threat may gain the king’s favor for those you swore to protect, but it could easily cost you your life. 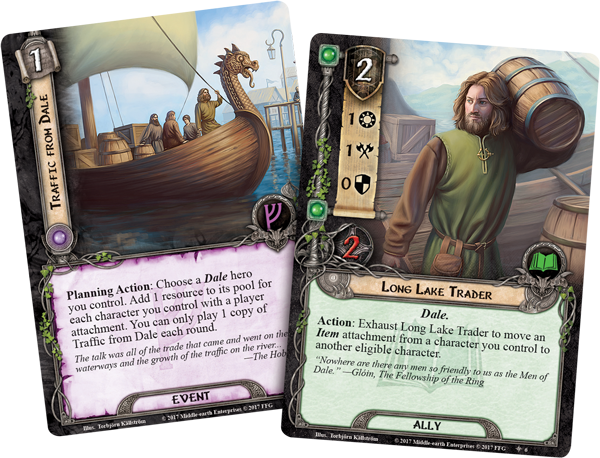 In addition to the three new adventures, The Wilds of Rhovanion also introduces an assortment of new player cards. 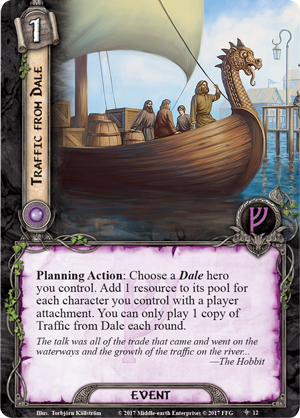 In the time since the dragon Smaug’s defeat, Dale has become a prosperous trade hub. You will see this reflected in the many cards found in The Wilds of Rhovanion that focus on your ability to utilize Item attachments. In the streets of the city itself, Traffic From Dale (The Wilds of Rhovanion, 12) offers the city’s residents additional resources equal to the number of attachments they possess. Meanwhile, you can call upon the aid of a Long Lake Trader (The Wilds of Rhovanion, 6) to help move the merchandise, exhausting this ally to move an Item attachment from one of your characters to another. But perhaps the strongest of Dale are the noblemen of the city who draw their power from those they lead. 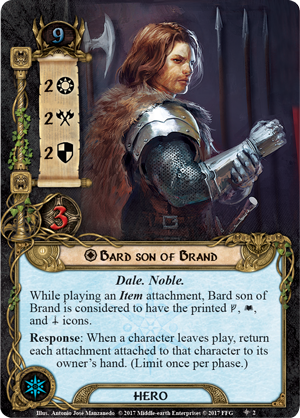 Descendant of the famed bowman who slew Smaug, Bard Son of Brand (The Wilds of Rhovanion, 2) is a man of Dale, and trade runs in his blood. When the city prospers, so does he. While playing an Item attachment, Bard Son of Brand is considered to have Leadership, Lore, and Tactics spheres. Additionally, once per phase, Bard lends you the ability to return each of a character’s attachments to your hand when they leave play—keeping them from being discarded and allowing you to reuse them again and again. 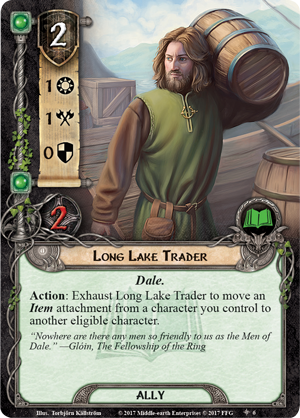 Beyond the trade skills and tactics that you can learn from the residents of Dale, the exotic merchandise they deal in also has great value in The Lord of the Rings: The Card Game. In The Wilds of Rhovanion, certain Items such as the Necklace of Girion (The Wilds of Rhovanion, 11), bear a new version of the Guarded keyword. When a card with the Guarded (enemy) or Guarded (location) keyword enters play, you will discard cards from the encounter deck until a card of the indicated type is discarded. Then, you add that card to the staging area and attach the Guarded card to it as a guarded objective. 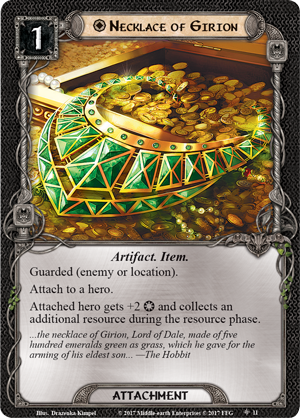 For example, if during the planning phase you play Necklace of Girion, which has the Guarded (enemy or location) keyword, you will discard cards from the encounter deck until you find an enemy or location. 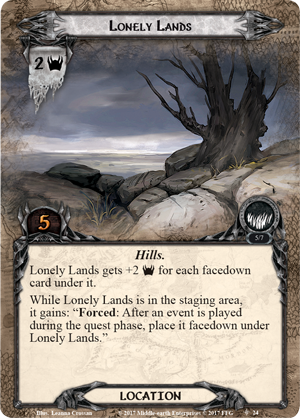 In this case the first card discarded is Lonely Lands (The Wilds of Rhovanion, 24). You'll then add Lonely Lands to the staging area and attach Necklace of Girion to it as a guarded objective. Once the Lonely Lands is explored, you can take control of the Necklace of Girion and attach it to a hero of your choice: in this case, Bard Son of Brand. Bard now gets +2 willpower and collects an additional resource during the resource phase. By learning from newfound allies and using these powerful implements, you will be ready to confront any dangers that lurk in the Wilderlands. Middle-earth awaits. Gather your allies, protect the Haradrim, and set out for daring adventures in The Wilds of Rhovanion! Look for The Wilds of Rhovanion (MEC65) when it hits shelves in the first quarter of 2018! You may also preorder the expansion at your local retailer or on the Fantasy Flight Games website here!